Elephant in the room means that there is an obvious problem or difficult situation that people do not want to talk about. This idiom is the central idea of an upcoming contemporary fiction Elephants In The Room by Suraj Laxminarayanan. It is his debut book. He is a software engineer by profession but a writer by his passion. I had the privilege to interview him where he spoke about his career, hobbies and put forth his opinions. Ques: Tell me something about yourself? Suraj: I am a software engineer settled in Bangalore. I mostly love to spend time reading crime thrillers. In my free time, I write and I ensure that this happens every day. Reading a book in a month and a movie a week is absolutely for me! Moreover, I think I am the only person left in my batch who still reads. I am a big fan of Rafale Nadale and love to indulge myself in tennis matches at a local club. Because I am a travel freak, I make sure to visit new places each year. Ques: When did you realize that writing is your cup of tea? Suraj: When I was a child, I used to watch cartoons. It inspired me to write my own stories. I had plenty of ideas. I developed a penchant for writing in the due course of time. Ques: What was your inspiration behind Elephants in the Room? Suraj: I have always been interested in suspense thrillers. The stories which end with an unexpected twist intrigue me the most. I am into a habit of reading newspapers which is full of crime stories. I think upon the substance of those actions. And perhaps, this is how my debut book got its form. Chennai is my hometown but I reside in Bangalore. So while I was traveling between the two places, I suddenly stumbled upon the idea of writing this book. Subsequently, I developed the skeleton of the book, discussed it with my friends and colleagues and came out with the final product. It’s like, due to my inclination towards crime, the seed was always there but the book turned out to be a result of sheer serendipity. Ques: Is there a hidden meaning behind choosing this title for your book? 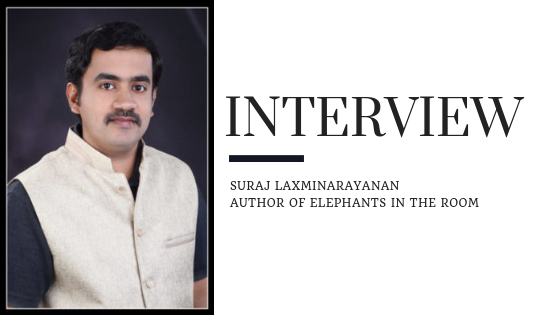 Suraj: It is actually derived from an idiom ‘Elephants in the room.’ It means that people refuse to acknowledge a situation due to the difference in perceptions. This is where the book is set. In the story, the title is strongly linked to a Room and multiple elephants in the room. Ques: The book deals with several absurdities. How do you handle them in your life? Suraj: I believe that there is no perfect training available for dealing with unexpected situations in life. One can never be prepared for everything. Try to focus on the solution and be prepared to ask for help. Don’t hesitate. Take the help of Concept of Intelligence which means to include the capacity for logic, understanding, self-awareness, learning, emotional knowledge, reasoning, planning, creativity, and problem-solving. Every problem, every challenge is a learning experience. Cherish it. Remember to have hope in life. It is, by all means, a good thing. Try fighting till the last point. Ques: Is the book based on your general observations or purely a product of your imagination? It is a blend of both. But yes, the basic premise is imagination. There is a remote possibility of the story being true. The characters in the book are trapped in a room. To write it better, I isolated myself to experience their mental state. I experimented to make my work genuine. A lot of research was put in to come up with the final draft. The places described are real and so, I personally visited them to get a feel of the atmosphere and the people. For the book, I devised my own vocabulary. In this way, I have thoroughly enjoyed writing my first book. Ques: As mentioned in the blurb, the group of friends is driven more by emotions than their skills in robbing a bank. What is your take on such criminals? What should be the role of society in helping them? Suraj: There are times when the criminals are driven by their circumstances. It is the consequence of the conditions they have to face that they commit crimes. A certain amount of aid is provided by the society in making someone criminal. Society can be more compassionate towards them. But it can’t be helpful to everyone. The Government has a major role to play in this matter. It must work to provide financial stability. This might drive them away from wrongdoings.